Listen to a debate Moody Radio in Chicago asked me to do. 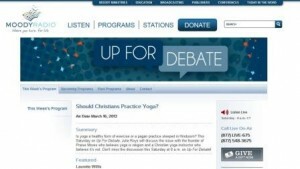 You can hear my debate on Moody Radio and read two astounding testimonies from women who listened to the program HERE. There are those who seek to validate their teaching yoga to Christians by placing words such as “Holy,” “Scripture,” “Atoning,” even the redemptive name of our God (Yahweh) before the word yoga. Do not be deceived. Remember, so-called “Christian yoga” IS yoga. “But know this, that in the last days perilous times will come: 2 For men will be lovers of themselves, lovers of money, boasters, proud, blasphemers, disobedient to parents, unthankful, unholy, 3 unloving, unforgiving, slanderers, without self-control, brutal, despisers of good, 4 traitors, headstrong, haughty, lovers of pleasure rather than lovers of God, 5 having a form of godliness but denying its power. And from such people turn away! “6 For of this sort are those who creep into households and make captives of gullible women loaded down with sins, led away by various lusts, 7 always learning and never able to come to the knowledge of the truth” (2 Timothy 3:1-7). I was one of those gullible women! I was “always learning,” but I was never able to come to a knowledge of the truth–until I came to the end of myself and surrendered to the One whose name IS Truth.